Erich Röhn (1910-1985) will be known to collectors as the last soloist to play at the Philharmonie in Berlin prior to its destruction by Allied bombing on 30 January 1944. The concert in question took place sixteen days earlier on 14 January and was conducted by the Berlin Philharmonic’s principal conductor Wilhelm Furtwängler. The work the violinist performed that night was the Beethoven Violin Concerto, and it was taped for posterity and that performance has had several outings on CD. It’s compelling, intense and passionate. Until this Meloclassic CD came along, this was my only exposure to the violinist. He was born in Germany and can trace his pedigree to Joachim through Else Mendel-Oberüber with whom he started violin lessons as a child. Then it was on to the Berlin Municipal Conservatory, where he studied with Ria Schmitz-Gohr and Gustav Havemann. Röhn subsequently carved out a career as an orchestral concertmaster after serving time in the First violin section of Berlin’s Kroll Opera under Otto Klemperer, the Opera’s director. When the Opera closed in 1931, he took on his first role as concertmaster with the Orchestra of the Deutschlandsender Berlin. Promotion was on the cards when Furtwängler selected him as concertmaster of the Berlin Philharmonic, a position he shared with Hugo Kalberg and Siegfried Borries. In 1941 he succeeded Borries as First Concertmaster. Already by this time, Röhn was carving out a second career as a soloist, and gave performances in this role with such eminent names as Leo Borchard, Hans Knappertsbusch and Hermann Abendroth. Out of the performances on offer here, it is the Bruch Concerto that fares least well, revealing shortcomings in Röhn’s violinistic arsenal. It’s relatively small-scaled playing, and he doesn’t convey quite the emotional range achieved by some violinists I’ve heard. His one speed fast vibrato renders his playing monochrome and has a tendency towards stridency in some high passages, with his double-stops lacking vibrancy. The violin is forwardly placed, with the Großes Berliner Rundfunkorchester somewhat recessed, resulting in some loss of orchestral detail. Hanns Steinkopf does not inspire his players, and his accompaniment is rather pedestrian. I got the impression that for most of the time he was on automatic pilot, not engaging with the soloist. For some reason the Beethoven Romance, recorded four days later with the same forces, is in much improved sound. Steinkopf is on better form and inspires Röhn to achieve heights not attained in the Bruch. The Schubert Rondo dates from 1943, the year Röhn became head of the BPO’s chamber ensemble the Kammermusikalische Vereinigung der Berliner Philharmoniker. It is they who accompany him in this delightful performance, full of Viennese charm and affability. It’s a rarely performed work and I must admit to never having heard it before, so it makes a welcome addition to this programme. In the Vivaldi, the violinist is joined by Rudolf Schultz and Georg Kniestadt on violins with Michael Raucheisen at the piano. It’s a heartfelt performance, with all musicians participating in a performance of shared purpose and congenial ensemble. Finally, Raucheisen accompanies the violinist in a warm and intimate reading of the Rondo for violin and piano in G major by Beethoven. Excellent liner-notes in English provide an informative biography of the violinist, with the addition of three interesting photographs. My only quibble would be that I would have appreciated more of a pause between tracks. 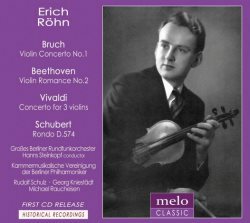 However, many thanks to Meloclassic for adding to the virtually non-existent discography of this little-known violinist.